Watch your child discover the joy of reading with a little help from a furry friend at the North Olympic Library System’s (NOLS) Forks Branch Library. Canine pal Tally and her trainer Sherry Schaaf from Olympic Gentle Paws Therapy Dog Club. This is for children of all ages. Research shows that the more a child reads, the more their reading skills improve. Children are sometimes reluctant to read aloud because they feel unsure or self-conscious. 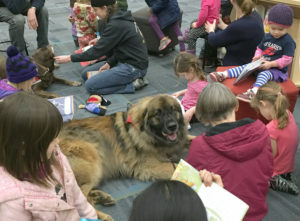 Reading to a dog or other pet provides a non-judgmental audience and encourages children to read with confidence.